We are proud to be a wholly owned, managed and run Australian Business. Located on the eastern fringe of Melbourne, O.P.S. 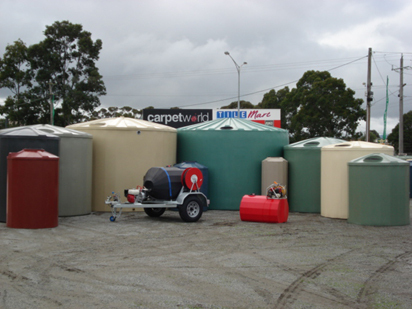 Country Tanks has been providing Victorians with quality rainwater tanks and other products since starting business in 1998. We pride ourselves on providing a high quality and broad range of products that allow you to capture and utilise our most precious resource! FREE delivery to most areas in Victoria and in addition to this we will get you going with what you need and want promptly and as soon as possible. I purchased 2 x 5,000 Gallon Plastic Tanks from your display at Farm World at a very competitive price. They were delivered a couple of weeks ago as agreed. I am writing this to compliment and thank you for this outstanding service. This is a great way to run a business – “Best price and best service” Our next tank(s) will come from your company.